New research shows underground communication network helps plants stay healthy. We all know plants are living things – but until now, we didn’t know they could talk, too. Results of a new study reveal that plants use an underground network of fungi to warn each other about insect attacks. The study, carried out by researchers from the University of Aberdeen, the James Hutton Institute and Rothamsted Research, demonstrates plants’ ability to send warnings about incoming aphids to other plants connected to their network. Plants send out a chemical signal that repels aphids and attracts predatory wasps, who then attack the aphids. However, plants that were not found to be connected to the fungal network did not send out warnings to other plants after being attacked. 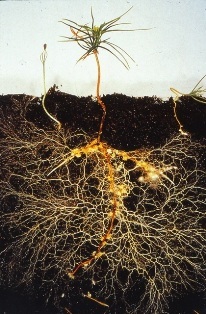 The plants use mycorrhizae to communicate, the study shows. This research supports previous findings that have shown plants communicate with similar chemical warnings through the air. Plants in the network were covered with bags to ensure they were not sending signals through the air. Picket said the discovery could lead to growers using fungi as an advance warning system for their crops. The theory, he said, is to use a sacrificial plant at a distance from crops and if it fell under attack, it would warn the others, giving them time to build a defense.